Back in 2012, Alan MacDonald’s paper in Environmental Research Letters (ERL) revealed that there’s a lot more water beneath the African continent than most people suspected. 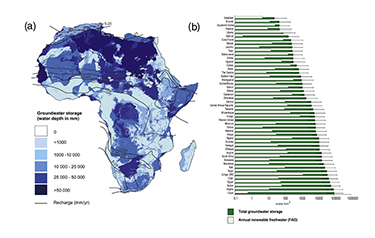 “Quantitative maps of groundwater resources in Africa” is one of the open-access journal’s most highly downloaded papers, clocking up more than 83,000 downloads and 49 citations to date. The article hit the headlines worldwide, bringing the British Geological Survey researcher and his colleagues to the BBC News website, The Telegraph, AlJazeera, Mail Online, Huff Post, Reuters, Yahoo! News, Spiegel Online, Welt Online, Elmundo.es, Le Monde, and more. More than three years later, we caught up with MacDonald to find out the impact of this publicity and where the paper has led.